Sky in front of the Green River in Henderson County. Photo: Hendersonville Times-News. Our Esther Cunningham Award is given in honor of Esther Cunningham – the founder of the Western North Carolina Alliance, one of three organizations that merged in 2015 to become MountainTrue. To celebrate Esther’s legacy, this award is given to people who have fought the fight, often giving over a large portion of their lives to these battles, who win some and who keep fighting even in the face of defeat. Sky Conard is one such person. We became aware of Sky in 2010, when she formed the Green River Watershed Alliance to help protect, restore and plan for the Green River in Polk County. As a resident at Lake Adger, she saw firsthand the impacts of poor land management and the lack of water planning for the lake and the river. Since then, Sky fought the proposed Lee Nuclear Station in SC due to the impacts it would have had on the Green and Broad rivers; she secured funding for a watershed assessment and convinced NC’s DEQ to add new water quality monitoring sites on the Green River; and she pushed Polk County to prepare a report on repairs needed for the nearly century-old Lake Adger dam. In 2015, she created another group called Protect Polk Water to fight the proposed sale of the Polk County water system to an outside entity. This would have been a terrible deal for residents and elected leaders were doing their best to do it quietly, including having one important meeting at 6 a.m. Sky wasn’t about to let this meeting go unnoticed. She organized a protest, asking people to show up in their pajamas. The media loved it and, needless to say, the Commissioners didn’t try that again. The proposed deal later died, due in no small part to the attention Sky generated. 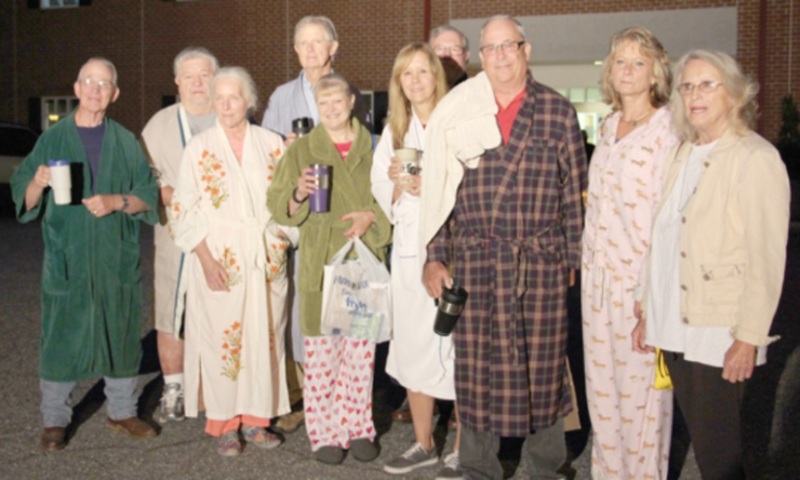 Polk County Commissioners did their best to quietly sell the county’s water to a private entity by holding a Commission Meeting at 6 a.m. Sky organized community members to show up bright and early to the meeting for a “pajama protest.” Sky is second from the right in her wiener dog pajamas. 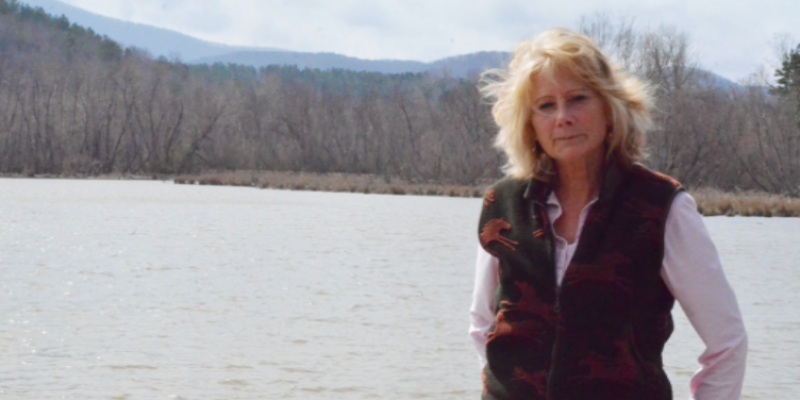 She has since turned her attention to Lake Adger, where she has tirelessly campaigned to get the state to meet its obligation to dredge the vast amount of sediment that has poured into the lake over recent decades. Again, against all odds, she secured a dredging feasibility study, hired a drone to get aerial photos and secured a pledge from the state to dredge the marina channel. Sky also recently encouraged MountainTrue to create the Green Riverkeeper program. This should mean we’re doing more and she’s doing less, but that’s not Sky. She’s still out there, scouting problems, raising alarms and fighting for our watershed. Sky, thank you for your dedication, your passion and your vision for a healthy Green River watershed. Thank you for carrying on the legacy of Esther Cunningham – an ordinary person who became extraordinary because she cared deeply about the world around her and wasn’t content to sit by and let it be harmed. To sign up to volunteer with MountainTrue, visit www.mountaintrue.org/eventscalendar. Can You Help Support This Work? Help Us Protect Western NC's Natural Places Today.